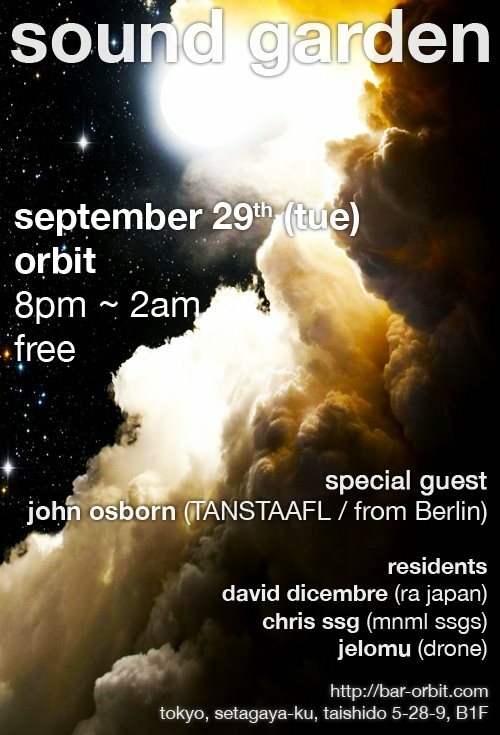 John Osborn is in Tokyo for a bit longer after his successful set at Unit last Friday night. We thought we’d take this opportunity to invite him to show off the kind of music he listens to at home, and in quieter moments. While John is generally known for his more upbeat sets blurring techno and house, we are very interested to hear him play a rare ambient and downbeat set. And for this edition, after almost a 2 year absence we are returning to our original home of Bar Orbit in Sangenjaya. Looking forward to being back there… So please come and join us for a drink at the end of your day. It is free entry, but 1st drink will cost 1,000 yen. Info and timetable below. Orbit is about a 5-10 minute walk from Sangenjaya station, and it is in the basement, so look for the sign and stairs leading down.